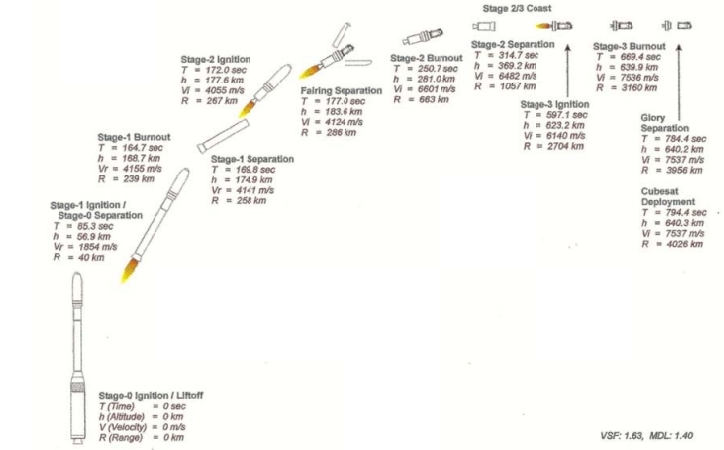 Projected T9 Glory Nominal Trajectory (Credits: NASA Investigation Report). NASA has released a summary report on findings from a panel that investigated the unsuccessful 2011 launch of the agency’s Glory spacecraft. The satellite, designed to improve our understanding of Earth’s climate, was lost March 4, 2011, when it failed to reach orbit after launch aboard an Orbital Sciences Corp. Taurus XL rocket from Vandenberg Air Force Base in California. A mishap investigation board led by Bradley C. Flick, director of the Research and Engineering Directorate at NASA’s Dryden Flight Research Center in Edwards, Calif., determined the Taurus launch vehicle’s fairing system failed to open fully and caused the mishap. The fairing is a clamshell nosecone that encapsulates the satellite as it travels through the atmosphere. The mishap investigation board was not able to identify the definitive cause for the fairing system failure, but it did recommend ways to prevent future problems associated with the joint system that makes up the fairing. NASA and Orbital are continuing to investigate the fairing system. The summary report provides an overview of the mishap investigation board’s findings. The board’s complete report is not available for public release because it contains information restricted by U.S. International Traffic in Arms Regulations and information proprietary to the companies involved.